A few years ago, Suzanne Somers identified the 'Seven Dwarfs of Menopause' as... Itchy, Bitchy, Sleepy, Bloated, Sweaty, Forgetful and Psycho. I recall watching her on Oprah and thinking that her remedy to banish the little fellas by taking 40 pills in the morning, 20 pills in the evening, intravaginal estradiol and applications of topical bioidentical estrogen and progesterone indicated that an 8th dwarf "Squirrelly", had joined the group. Comforted in the thought that I was one of those fortunate women who experience little (if any) discomfort associated with the hormonal shifts of menopause...BAM! With little advance warning, I am as surprised as the next guy when I suddenly became an itchy, bloated, sweaty, bitchy, forgetful psycho. 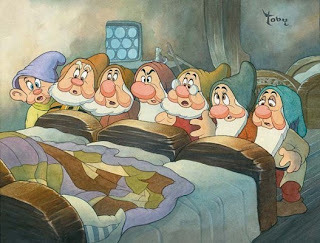 The good news: The dwarfs tend to exit within minutes of their arrival. The bad news: I am left to sheepishly explain just why the dish towel folded over the oven handle incited WW III at the Spotswood residence recently. A word of warning: It is not in anyone's best interest to discuss my displeasure of trivial matters during a hormone surge. I'm just saying. YOU JUST WOULDN'T GET IT! Sorry for shouting. It wasn't me. It was "Bitchy and Psycho". So, as Mr. Something scrambles to turn on a fan, provide me with a glass of ice water and a cold pack, I can't help but tune in to his wistful reminisces of what he refers to as "the good ole days of PMS". Nancy! Thanks for dropping by. I'm glad you like it. Miss you.